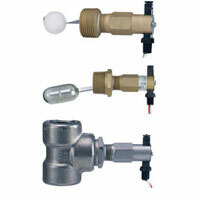 The Mini-Size Series L10 Flotect® Level Switches combine low cost with top quality materials and construction for great value and years of reliable liquid level control. Wide media compatibility is assured with a choice of brass or stainless steel bodies and external tees; polypropylene or stainless steel floats. Two basic configurations are offered; with 1" NPT male threads for direct side mounting through a half coupling or with factory installed tee for external mounting. All Series L10 controls feature a hermetically sealed, magnetically actuated SPST reed switch which is encapsulated in a polypropylene housing. Units are quickly and easily adjusted for your choice of normally open or normally closed operation thanks to a unique patented design. Just loosen two screws and instantly slide the switch assembly to the action required. N.O. and N.C. markings are clearly visible. This feature also speeds switch replacement if damage occurs. Three types of floats are offered to accommodate liquids with specific gravities as low as 0.5; maximum pressures to 2000 psig (137.8 bar). Wire leads are 22 AWG X 18" (460 mm) and exit the switch assembly through 1/8" male NPT threads. These controls are UL recognized and CSA listed. Wetted Materials: Float: Solid Polypropylene or 304 SS; Body: Brass or 303 SS; Magnet: Ceramic; External Float Chamber (Tee): None, brass or 304 SS; Other: Lever Arm, Pin, Spring, etc. : 301 SS. Pressure Limit: See Catalog page. Switch Type: SPST hermetically sealed reed switch. Field adjustable for normally open or normally closed. Electrical Rating: 1.5A @ 24 VDC resistive, 0.001A @ 200 VDC resistive, 0.5A @ 125 VAC. Electrical Connection: 22 AWG, 18" (460 mm) long. Conduit Connection: 1/8" male NPT. Process Connection: 1" male NPT standard on models without external float chamber. Change 3 in model number to 4 for 1-1/4", to 5 for 1-1/2", or 6 for 2". 1" female NPT on models with external float chamber. Mounting Orientation: Horizontal with index arrow pointing down. Weight: Approximately 9 oz (0.255 kg) without external float chamber, 2.25 lb (1.02 kg) with external float chamber. Specific Gravity: See Catalog page.